Chloe Gordon learns how to give costumes the lived-in – and painted-in – look. You might have already had a sneak peek at the Red production photos. 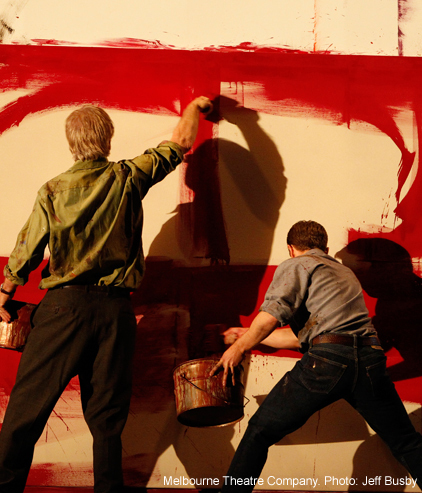 Perhaps you’ve watched actors Colin Friels and Andre de Vanny in the trailer video for the play, manically covering a canvas in red pigmented glue. Maybe you have come to the conclusion that this show is messy. You would be right. Against the great reproductions of Rothko’s red canvases and the impressive chaos of the studio, the practical painting clothes worn by Rothko and his assistant, Ken, may fly under the radar. This was intentional, according to Costume Designer Jill Johanson, who says, ‘It was important to use a colour palette that complemented the set and the art works being created’. However despite their subtlety, some meticulous work has gone into creating the painters’ wardrobes. For a start, you wouldn’t want their clothes to look too new. Johanson explains that the two painters would have worn the same wardrobe of work clothes over and over, ‘until they were too damaged to wear’, so the garments you see the characters wearing onstage have probably been lived in and painted in for much of the past few months. How did Johanson (mis)treat the garments to make them look as though they’d had an interesting life? After an initial wash, she applied paint in the colours Rothko really used in the Seagram murals. The paint-spattered garments were then placed in a hot drying room, to set the paint. Using an iron for this job was out of the question. Throughout the season, the garments will be laundered on a strictly minimal, non-ironing basis, so as to preserve the worked-in quality of the fabric. 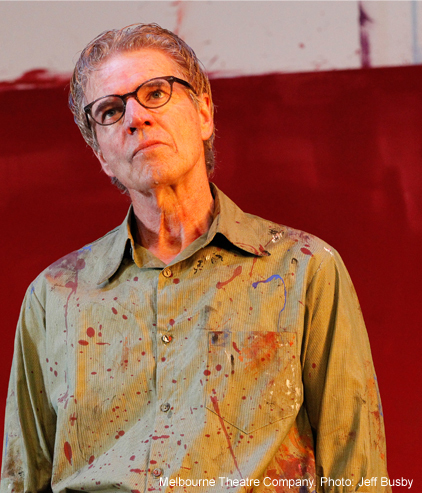 Unlike other productions and more like the real lives of Rothko and ‘Ken’, the wardrobe consists of multiple changes of clothing, ensuring the paint-spattered items are not laundered too often in the course of the season. If all fails and the shirts and pants begin to look too clean, Johanson is standing by with more marvellous red, ready to do some re-spattering. Although, if the paint-happy antics of the onstage actors are anything to go by, this may not be necessary. Colin Friels and Andre de Vanny in Red. To learn more about Red, take a look at our Inside the Rehearsal Rooms video, which features interviews with the cast, and director Alkinos Tsilimidos. Red is playing at the MTC Theatre, Sumner, until 5 May.